No trip to Georgia would be complete without a few days’ stop in Tbilisi. With a history dating back thousands of years, the city is a living testimony to the diversity of the country, as each of its many conquerors and rulers has left a mark on the landscape throughout the years. Orthodox churches coexist with ancient mosques, caravanserais with Soviet-like buildings, making a visit to Tbilisi feel like travelling through the centuries, as if the city were an open-air history book. Tbilisi isn’t all about ticking boxes on a bucket list though, but rather about getting lost to truly feel its atmosphere. Yet, there are some places that deserve to be seen to make the most of what the city has to offer, among which you will find the five places listed below. 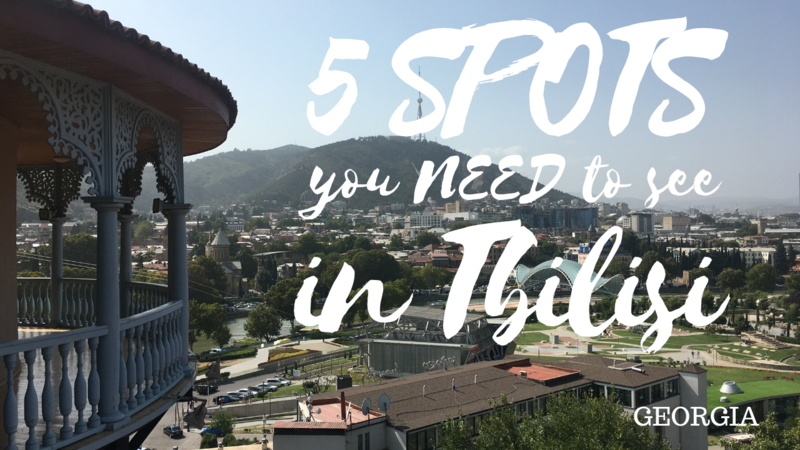 With its intriguing domed brick roofs looking straight out of a Star Wars movie, this neighbourhood is one of the most iconic places in Tbilisi, precisely for what lies underneath the domes. Nestled among natural hot springs, Abanotubani is home to sulphur bath houses. Even for those who might not be huge fans of spas and massages, the district is a must-see for its architectural diversity. Looking at the blue-tiled façade of the Chreli Abano spa, you’ll think you are in Iran, although the silhouette of the Church of Metekhi in the background will remind you that you haven’t left Georgia. The old city isn’t too far either, making Abanotubani one of the best starting points to wander around the narrow streets of the old district and discover its carved, typical wooden balconies. Established in the 4th century, the Narikala Fortress was used alternately by the Persians, the Ummayads and the Mongols, but also by King David the Builder, embodying the history of the city itself. Nowadays, much is left to the imagination as only two walled sections remain, as well as the St Nicholas Church which was restored in the late 20th century. Beyond its historical interest, the fortress deserves a visit for the stunning view it provides on the city lying at its feet, giving an interesting overview of the many different architectural styles within the city. To get to the fortress, you can use a cable car that will take you near the Mother Georgia statue, which could be described as a very cheesy metaphor by the way, or you can climb there by foot. The latter will allow you to discover vivid houses, less touristy streets but also a few nice coffee shops. Could the Mtsatsminda Park be described as the Georgian equivalent of New York’s Central Park or London’s Hyde Park? It would be a stretch. However, Mtastminda is one of the favourite places for a stroll among the people of Tbilisi and has an undeniable charm, past its over-the-top looks. If you were looking for some sort of green lung, you will be surprised to find old-fashioned rides and merry-go-rounds instead, and even more surprised to observe that the park still feels quiet and relaxing, sitting on a top of a hill. The full experience requires riding on a funicular to get there but there is also a picturesque walkway from the Narikala Fortress all the way to the park for those who might want to escape the crowd. On the way down, the best option is to ride the funicular anyway, although you might consider stopping one station earlier to visit the inspiring Mama Daviti Church, which happens to be surrounded by the Georgian Pantheon. Tbilisi definitely is a city for church lovers, whether they are tiny chapels pervading devotion or huge shrines. The Holy Trinity Cathedral, known as Sameba, belongs to the latter. It is as massive as it is brand new, making it stand out from the many other churches in town which date back hundreds of years. Built between 1995 and 2004, it is now the main cathedral of the Georgian Orthodox Church and can be seen from almost every part of Tbilisi, as some grand temple overlooking the city. Its hybrid style, attempting at synthetizing many national architectural traditions, may not appeal to everyone. Sameba is bigger, taller, greater, and no stranger to controversy either. It is also precisely for those reasons that the cathedral is worth a visit, as it is truly one-of-a-kind. The cathedral is also stunning from within, covered in beautiful frescoes and still spiritually-charged. If you are lucky, you could even hear some polyphonic singing during your visit. The Georgian National Museum is actually various museums merged into one, which explains why it can feel all over the place. One moment you’re in a room dedicated to religious artefacts and a moment later you’re learning more about ancient Georgian war weapons or walking around stuffed animals in a natural history section. Even if the connection between all exhibition rooms might not always be clear, there is one common frame in the sense that all exhibited items relate to Georgian history as a whole. Well, apart from that one room with some Japanese and Indian arts, of course… If jumping from one topic to another doesn’t bother you and you want to learn about traditional outfits as much as about orthodox lithography, then the National Museum is a must-visit. The Soviet Occupation Exhibition Hall is especially riveting, due to an on-point scenography that conveys as much emotion as it educates on that part of the country’s history.